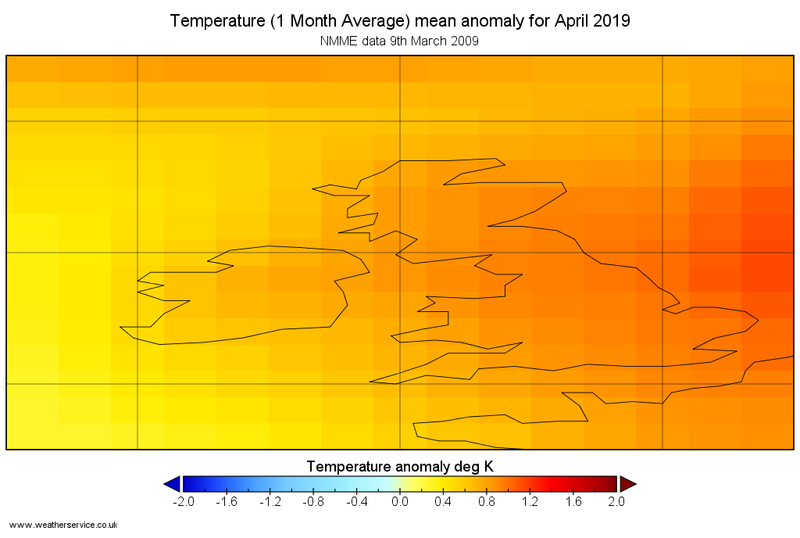 UKMO 280319 - 2nd to 26th April 2019 - A colder and unsettled spell with rain or showers and hill snow in the north. SW and S drier for periods. Around mid month turning more settled, especially in the south, and milder perhaps warmer in places. Further wet weather may affec the west adn southwest later. 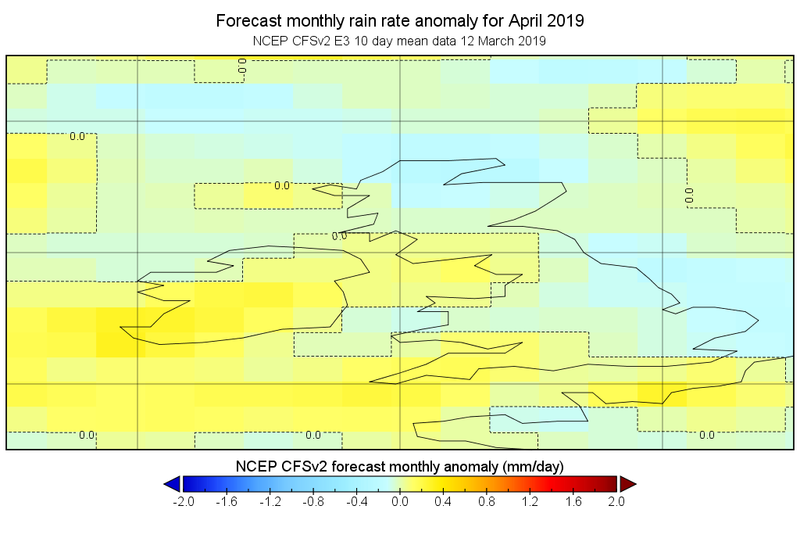 UKMO 210319 - 26th March to 19th April 2019 - Mostly dry under high pressure with risk of patchy fog and frost but in the NW more unsettled with some rain or showers. Becoming more widely unsettled for early April with rain or showers but then turning drier again although showers may spread from the south later. Near normal but perhaps slightly cool in the NW mainly at first. Elsewhere mostly above normal temperatures, warm at times. UKMO 140319 - 18th March to 11th April 2019 - Unsettled with rain/showers and windy, at first though more especially in the NW. The N may remains a little unsettled but elsewhere, especially in the S, becoming more settled and drier and this may extend further N for a time. Chance of weakly unsettled spells later. Temperatures near normal perhaps a little below normal in N at first. Later above normal especially in S. Still the chance of frost. Snow risk confinded to northern areas mainly high ground. UKMO 070319 - 12th March to 5th April 2019 - Mostly unsettled with rain or showers, wintry at times in the north, and often windy. Possibly a drier spell developing for a time in the south at the end of March or into April which could extend further north for a time. Average temepratures in south, colder in N. Possibly more frequent frost than average, trending warmer later in period. UKMO 020319 - 7th to 31st March 2019 - Changeable at times wet and windy with drier or showery spells in between, risk of snow for northern hills/mountains. Chance of frost in between wetter spells. Temperatures milder wet and windy spells with colder showery interludes. Chance of less unsettled/drier weather towards the end of March. 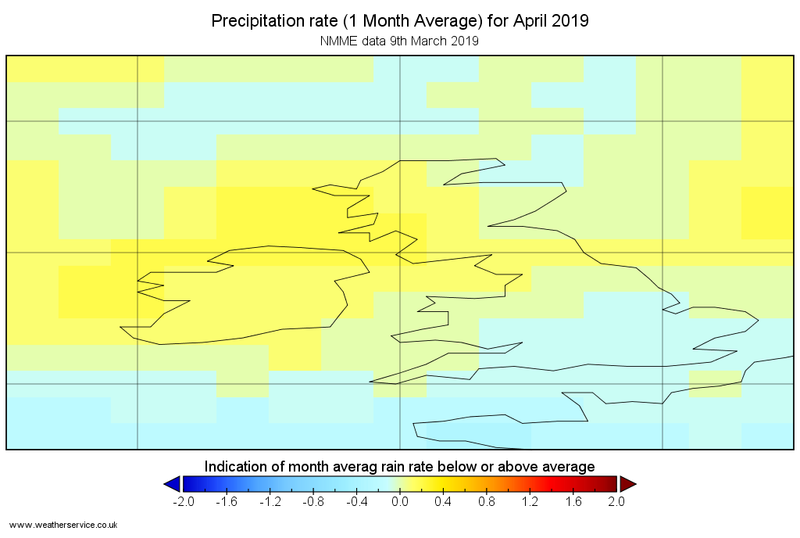 UKMO 270219- 3rd to 27th March 2019 - Unsettled at times wet and windy weather especially in the N and W, typically less wet in some E and SE parts. Snow risk for high ground in N. Chance of a longer drier spell for central and S/E parts late in March. Temperatures near or above normal. 28day mean - Temp above normal PPN below normal PMSL above or well above normal (H in S, W in N). 23-29 TEMP: above normal PPN below normal PMSL above or well above normal (H in S, W in far N). 30-5A TEMP: above normal PPN below normal PMSL above or well above normal (H in S, WNW in N). 6A-19 TEMP: above normal PPN below normal PMSL above or well above normal (H in W geneally slack). 28day mean - Temp above normal PPN N above S below PMSL above normal (WSW strong in N). 16-22 TEMP: above normal PPN: above normal PMSL: N below far S above (gale WNW). 23-29 TEMP: above normal PPN: N above S below PMSL:above normal (WSW strong in N) . 30-12 TEMP: above normal PPN: below but far N above normal PMSL: above normal (W, weak in S-ridge). 28day mean - Temp above normal PPN above normal PMSL below normal but normal in far S (WNW). 9M-15 TEMP: Far S above elsewhere below PPN: above normal PMSL: below and well below in N (Glae WNW). 16-22 TEMP: above normal PPN: above normal PMSL: below normal (WNW). 23-5A TEMP: above normal PPN: N above normal elsewhere below PMSL: above normal (WNW). 28day mean - Temp above normal PPN above normal PMSL below normal perhaps near normal in S (W strong). 2M-8M TEMP: above normal PPN: above normal PMSL: well below normal (gale WNW). 9M-15 TEMP: above normal PPN: above normal PMSL: S above normal N below (WNW strong). 16-29 TEMP: above normal PPN: above normal PMSL: S above normal N below (WNW strong). PPN : N above normal, S 60% below 40% above. 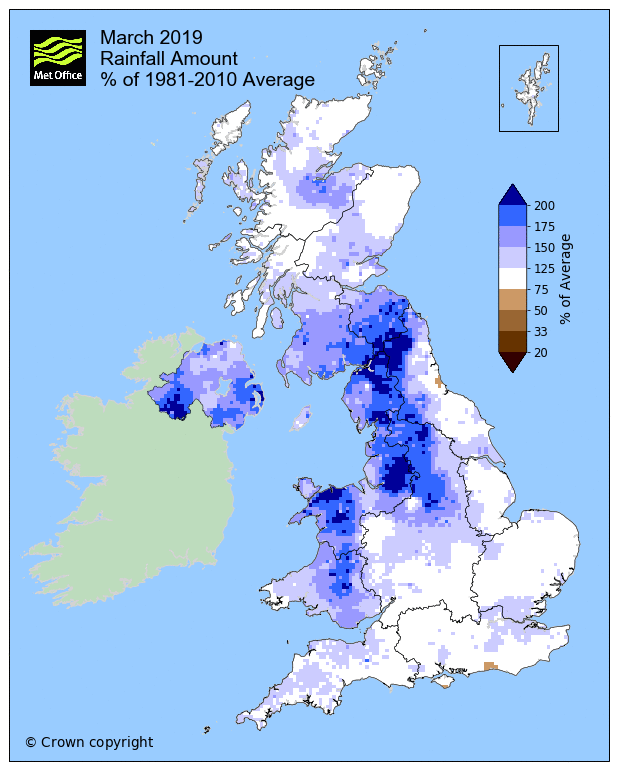 PPN : above normal but chance of below in SW UK and SW Eire. March single issue forecasts issued late Feb/early March. March: Above normal most likely (only about 10% of members are below normal and the distribition is shifted to warmer conditions with about 25% showing well above average forecast values. March: Uncertain. Similar probabilities for above and below normal, perhaps slightly favouring wetter. Could be a split solution with N wetter and S less so but not able to determin this from issued graphics. A minority of forecast solutions exceed the climate range both above and below. PPN : Below normal (3/8), below in S (5/8) otherwise normal. 2. CFS2 seasonal anomalies are with respect to the lead dependent model climatology from the hindcast period (1999-2010) without any adjustment - a very warm decade!. 3. 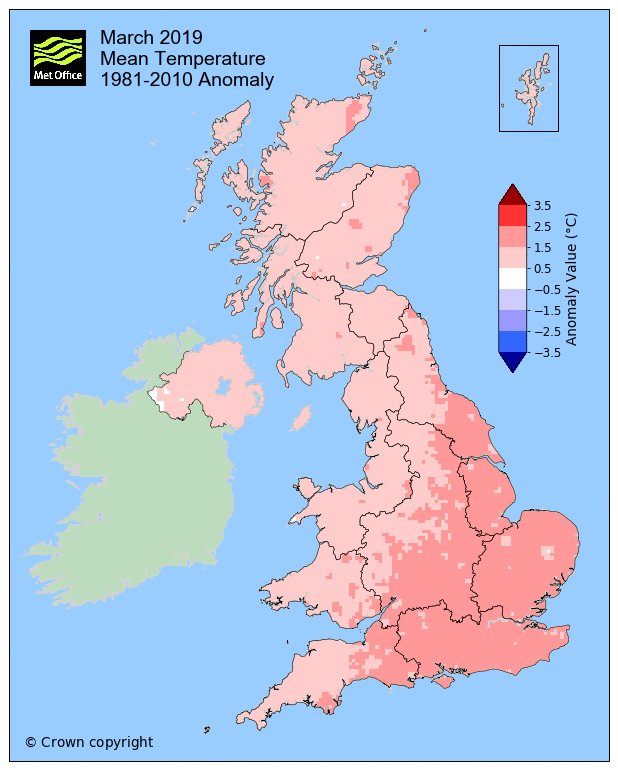 UKMET The hindcast period used for model normal is 1996 to 2009. 42-member ensemble seasonal forecast (120KM res over land) combining and bias correcting all forecast members available prior to issue. 4. 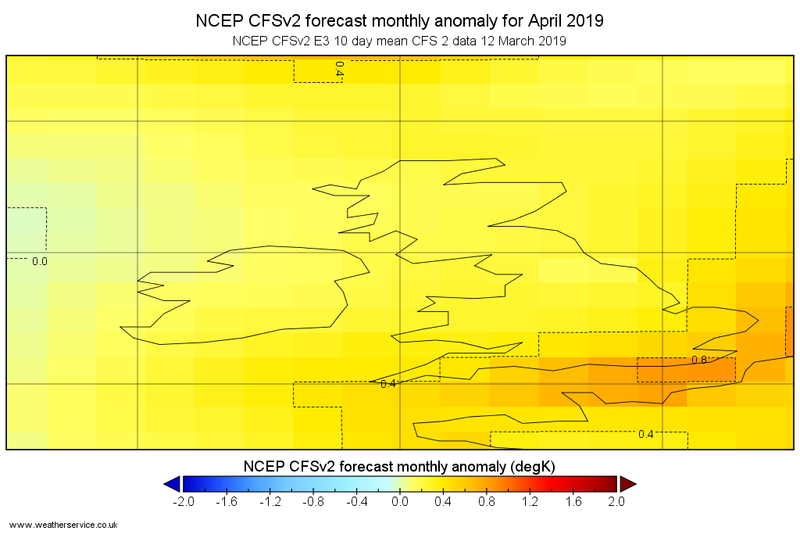 CFS2 Weekly forecast anomalies are with respect to 1999-2010 hindcast climatology which was a warm period (SST 1982-2010) also mostly a wet period for Uk compared to longer period stats. 5. NMME data, please see the BAMS article (Kirtman et al. 2014). The NMME project and data dissemination is supported by NOAA, NSF, NASA and DOE. with the help of NCEP, IRI and NCAR personnel in creating, updating and maintaining the NMME archive.